Booster Capsule supports systemic balance in the female reproductive, Circulatory and hormonal system responsible for sexual arousal. 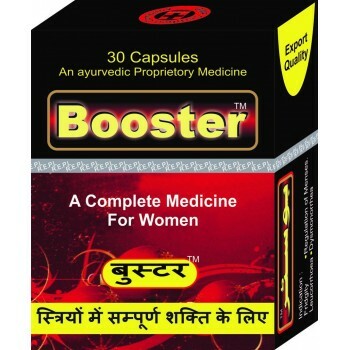 Shelf life and special conditions for storage: Booster Capsules is a Ayurvedic medicine, so it may be kept forever if It should be stored in a cool, dry place, should be proper & tightly caped and protect from sunlight. Dispensation: With prescription - It is recommended to use the medicine on prescription. SAANDHHA ® Oiil (Sanda Oil) Massage oil for Penile Nourishment, Harder Erection and Longer performance. We are ISO, GMP & PCIDSS certified manufacturer. Vigoura ™ 5000, a highly effective combination of drugs’ for functional & idiopathic Sexual Problems. Vigoura ™ 5000 - The natural relationship enhancer. It is formulated to help relieve impotence & erectile dysfunction (ED) in males. Nourishes Hair Root and scalp. Improves blood circulation to hair folicles. Stimulates growth of thicker, healthier and longer hair. Checks loss of Hair alopecia & arrests Dandruff. Vigoura-1000 indicated in Oligomenorrohea, Lactation`al Amenorrhoea Dysfunctional Uterine Bleeding, White Discharge, control Pelvic pain syndrome (PPS). Kamsutram ™ Oil is Penile Nourishment Massage Oil for men with 100% Safe & Homoeopathic preparation blended with secret aphrodisiac herbs suitable for improving male sexual systems especially related to Erection and Sexual Performances. Breastriim ® Oil is an ayurvedic breast massage Oil useful in strengthening, firming up and toning up of breast muscles, resulting in appropriate increase in one's breast size. Breastriim ® Oil is 100% safe with no side effects.